What, you are not obsessed? Give it time, my friend. Give it time. I was so happy to get 3 (!) 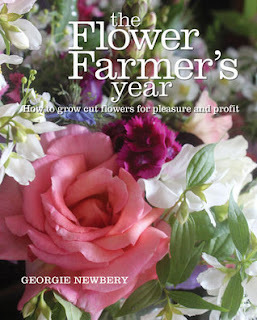 books from my Amazon wishlist for Christmas this year, all about flowers. Yes, this has contributed greatly to my flower-filled thoughts lately. On the one hand, it's great to read these types of books in the winter. You have more time to read, presumably, without as much to do in the garden. The colors and beauty are an antidote to winter's gray outlook. It's a good time to plan what you'll want and need for the upcoming year. On the other hand, I read these and then wanted flowers to experiment with right away! Cut flowers are expensive in the winter, and tend to not be as good in quality either. (I ended up buying a mixed bouquet from Costco to play around with.) So, there is that to consider as well. Consider yourself warned. 4 stars: Full of valuable information and gorgeous photography. This one starts off by giving you a purchasing guide for cut flowers, including what to look for to make sure they are fresh and will last. There's a short guide to conditioning flowers, and also a short chapter talking about tools and supplies, along with a few tips on various floral design techniques. From there we get into the meat of the book. She starts off with "The Elements of Design." I learned some great basics from this chapter. Floral designers think about flowers according to their form: round, spray, or line (or spike). She says that the round flowers will always be the focus of any arrangement, because the eye is automatically drawn to them. It makes sense, but I hadn't thought about it in that way. So if you're doing a mixed bouquet, you need at least one round flower to provide a focus and center the eye. Sprays and berries support the (round) stars of the show, and offer softness. She then says line flowers, like delphiniums or gladiolus, are used to bring color and texture from the edges into the center. She goes on to talk about texture and color. In floral design, green is a neutral you can use to link other colors in the arrangement together. The last 1/3 or so of the book showcases different designs and techniques, from vase designs, to hand-tied, to table flowers, and so on. She starts off with classic designs, then moves into contemporary. This part was fascinating to me. There's a full-page photo of an arrangement on nearly every 2-page spread, with her tips and notes on the facing page. So she'll tell you her method for creating the arrangement, including any special techniques or materials. Overall, I felt that I gleaned quite a bit from it. I'm glad I own it, so that I can go back through it once I have flowers on hand, and not only try my hand at some of the various designs, but continue to learn more about techniques and such from her. She does rely heavily on floral foam, which I do not plan to use in my arranging, but I'm confident I can work around that. 5 stars: I already want to re-read this one! Okay, this one was right up my alley! Newberry farms in the UK, so not everything was applicable, but most things were. She starts off assuming you're looking at an empty plot or field. Where do you start? How do you design your plot for efficiency and practicality? I was soaking up all the information I could from this beginning chapter, since this is the stage I'm in right now. She says that you don't have to a large variety of flowers to be a professional cut flower farmer. In fact, she maintains that you can get by with as few as 10, as long as you're smart about which ones you choose. She discusses plant propagation, including common greenhouse problems you may run into, planting windbreaks, making compost tea to feed the soil, and many other great basic topics. The middle part of the book spends a chapter each on several different categories of cut flowers: annuals, biennials, perennials, bulbs & corms, shrubs, herbs, wildflowers, etc. She has a separate chapter each on roses, dahlias, and sweet peas. Within each chapter, she talks about her favorite varieties to grow for cutting, along with tips for growing and conditioning that particular flower. One thing I really appreciated about her perspective was she always had her eye on the market. So for example, with roses, she points out that you want yours to stand out from the scentless hybrid tea roses usually sold in bouquets. So go all out for the many-petalled, romantic, and fragrant varieties. 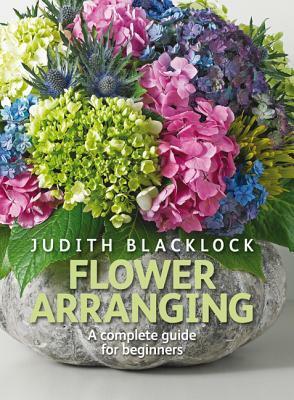 She makes many comments throughout the book with tips for making your flowers sell in a very competitive market. The last few chapters go into "Cutting, Conditioning, and Presenting" your flowers, extending the season into winter with "Hedgerow Christmas," "Starting a Cut Flower Business," "Where to Sell, and "Marketing and Social Media." These were all packed with useful information. If you just want to mess about with flowers but cringe at the thought of marketing them, then keep it as a hobby. She's pretty blunt about the challenges of making this work, which I actually appreciated. On this end, I need to hear that. The biggest takeaway for me was her advice to not over-invest at the beginning. I have been trying to decide how much to put into this, just starting out, knowing I don't have the space or time to make it a full-time venture yet. It was validating to hear a seasoned flower farmer say that it's okay to take it slower. It's probably best to do so, until you're assured of a healthy market and you know enough about what you're doing that you actually have flowers available to sell all season long. Fully illustrated with photographs throughout, with nearly one photo per page. Very useful. 5 stars: Useful tips and techniques; gorgeous photos. I want to try all the arrangements! While Blacklock's book deals more with traditional arranging, Chezar's style more closely echoes what I will probably be doing. I want to know and become proficient at the traditional and classic design principles, so I have that versatility, but I think my style tends more toward Chezar's, which she describes as "painterly." It tends to be looser, with more emphasis on local, seasonal, and even foraged elements. She suggests having just one or two colors in mind for an arrangement, then adding darker or lighter tones of those basic choices to add movement within your bouquet. Once you have chosen the colors, then you can focus on finding and adding in various textures, sizes, shapes, etc., all within your chosen color scheme. She has some great tips and techniques, as well. Rather than using floral foam for her arrangements, like Blacklock, she relies more on flower frogs anchored to the bottom of the vessel with floral putty. She suggests always starting biggest to smallest--so starting with a base layer of branches and/or greenery, and working your way up to focal flowers, and finally ending with vines or "floaters"--little sprays of flowers that will float above the main arrangement. Every one of her arrangements includes a vine of some type. I appreciated her advice on achieving abundant, generous bouquets without breaking the bank. Choose a handful of "dynamite" focal flowers, which tend to be most expensive anyway, then either grow or buy cheaper flowers to fill in around them. She advises searching thrift stores and flea markets for vessels to use: pitchers, footed compotes, vases, apothecary jars, and so on. Yes, this part will be fun. I may need a shelf or cabinet in our new shed just for my arranging containers! In the past I have mostly used either glass canning jars, or one of my glass vases. However, I really want to try some arrangements in a low, footed bowl. From there she goes into talking about various arrangements: tonal arrangements, favorite flowers, branch arrangements, and so on. Nearly every spread contains a full-page photograph of the finished arrangement, with a brief discussion, "recipe," and step-by-step instructions for creating it on the facing page. She likes to use fruiting branches in her arrangements, and even things foraged from the vegetable garden: sweet peas still on the vine, for instance. She also includes "alternate flowers" for each arrangement shown, which expands the possibilities even more. Her last chapter is "Celebrating with Flowers." She includes projects to make that are a bit different than some of others I've seen, including a marigold curtain and fern chandelier. Finally, the photographs in this one are simply fantastic. 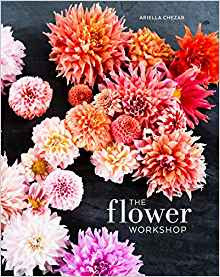 Whether illustrating her flower recipes, or just showing off flowers in various shades, it's worth the price of the book just to see all the pictures. I am delighted to add these three books to my flower library. I can see myself going back to all 3 of them--to try the arrangements, for more tips and advice, or just to look at all those photos again. I will admit that reading these racheted my spring fever up a notch. Totally worth it. Have you read any flower-related books that you would recommend?